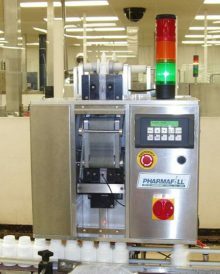 Wall, NJ: The new Pharmafill(TM) PS1 Packserter from packaging machinery manufacturer Deitz Co., Wall, NJ (www.Deitzco.com), automatically inserts desiccants, oxygen absorbers and other pouches into bottles. Ideal for filling and packaging foods, supplements, pharmaceuticals, nutracueticals and other moisture-sensitive products, the PS1 Packserter separates the desiccant pouches into individual packets from continuous strips and inserts them into bottles at speeds up to 100 pouches per minute. Designed with advanced sensing technology for unattended operation, the PS1 Packserter automatically raises an alert and stops the machine when the pouch supply is ready for refilling, if a container hasn’t appeared under the discharge tube or if a blockage prevents filling. Developed for contract packagers and manufacturers requiring a single machine that works with a wide range of pouches and containers, the new desiccant inserting machine may be adjusted to match different conveyor speeds, packet feed roll speeds, packet material thicknesses, container heights and diameters, and other criteria. With PLC controls in a touch-pad interface, the PS1 inserter is easy to setup, use and adjust with a minimal number of change parts for fast changeovers. A variable height lift platform is included to allow the height to be adjusted based on the bottle size without requiring adjustments to the conveyor. Manufactured at the company’s Wall, New Jersey, headquarters, the PS1 Packserter features food-grade stainless steel construction, a hinged panel cover for safe, easy access to the interior and a three-color stack light on a compact footprint measuring just 20 inches across. The PS1 ships fully tested and inspected with a full warranty. For more information on inserting desiccants, oxygen absorbers or other packets, contact the sales staff, Deitz Co., Inc.; 1750 Route 34, PO Box 1108, Wall, NJ 07719 USA; 732.681.0200; Fax 732.681.8468; www.deitzco.com; sales@deitzco.com.